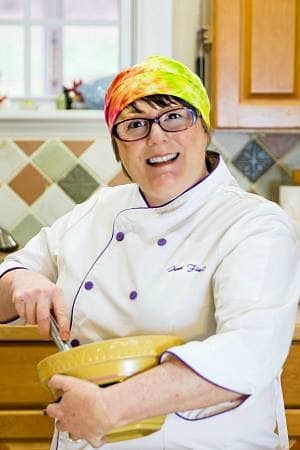 2 Sabra’s Executive Chef, MaryDawn Wright eats, sleeps and breathes hummus. Her love of and enthusiasm for the product is infectious. 3 A still from The Martin Agency’s in-house Sabra inspiration video. This short video made us all fall in love with the Sabra message. I was compensated monetarily and in travel/food/lodging expenses for this post. All opinions are my own. Thank you. 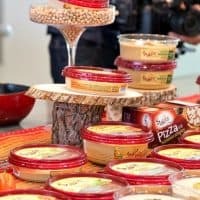 Last month, two groups of ten Sabra Tastemakers each had the privilege of touring the factory in Richmond, Virginia where Sabra produces all its hummus products. I was honored to be an attendee, and I am honored to be a Tastemaker. 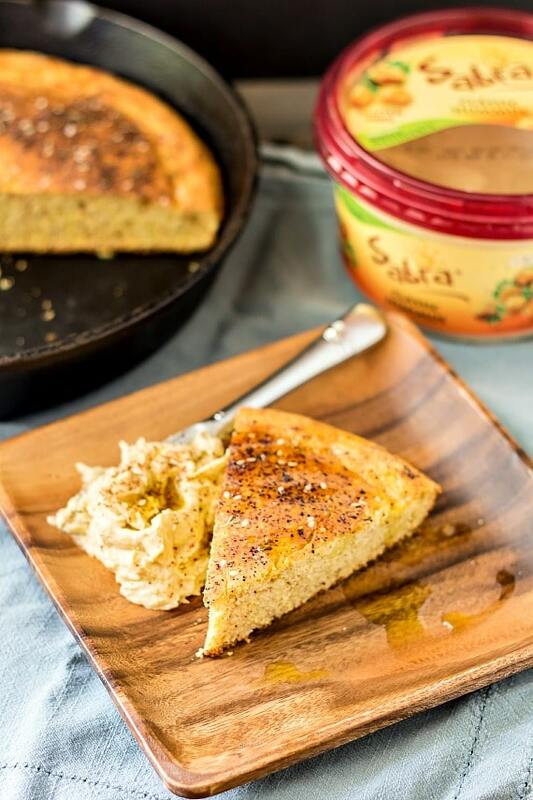 I have enjoyed hummus for at least twenty-five years, and I love being able to pick up one of Sabra’s numerous flavors at times when I am rushed or don’t feel like making my own. I also like the freedom to choose any one (or three or seven) of Sabra’s thirteen current flavors, from more traditional Classic, Roasted Garlic and Roasted Pine Nut Hummus (my personal favorite) to the more adventurous Chipotle, Supremely Spicy and Spinach and Artichoke. The weekend was packed with laughter, fun and camaraderie, and it was also crammed full of people and places passionate about hummus. 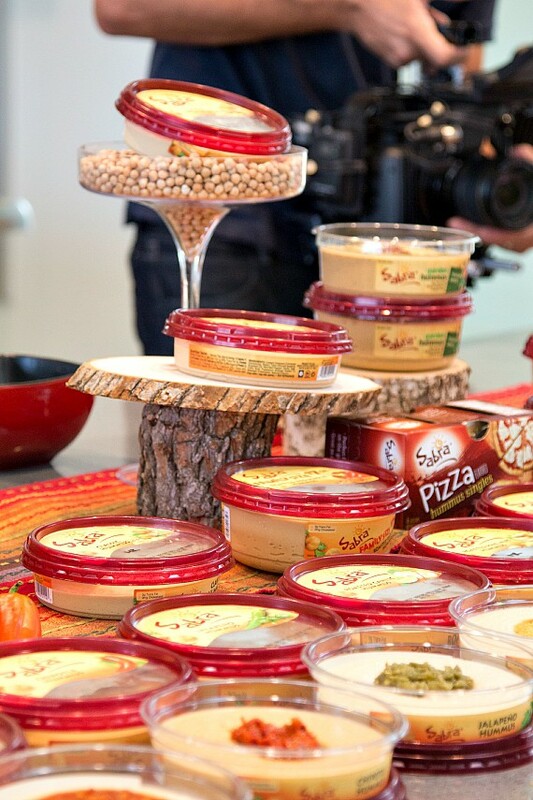 From the advertising agency to the PR agency to the folks at Sabra themselves, everyone was inspired to introduce hummus to new fans, to educate consumers about what hummus is and the many and varied ways it can be enjoyed and to produce the best possible products. Not coming from the world of advertising, I had no idea that advertising agencies produce their own in-house content that inspires them to conceptualize and create compelling advertising. Images of a riot of vegetables, of friends and family sharing food, of enjoyment, of laughter, of a communal table comfortably crowded with brightly colored food and brightly smiling people. Inspiration even from the colors of the products: white (Greek yogurt dips), yellow (hummus), red (salsa) and green (guacamole). The energy and passion put into the promoting of Sabra as a brand is more than matched by the energy and passion of the folks at Sabra Dipping Company. Their executive chef and team of food scientists are incredibly creative. They listen to their customers and are responsive to their feedback. They source their own proprietary blend of tahini (sesame paste) for the perfect Sabra hummus flavor profile. They buy a specific type of chickpea grown in the Pacific Northwest. Their manufacturing and packing facility is spotless, and their attention to worker and consumer safety is laudable. Having never been in a food manufacturing plant before, I came away with a new-found respect for the way Sabra safely and consistently produce an excellent product on a very large scale. 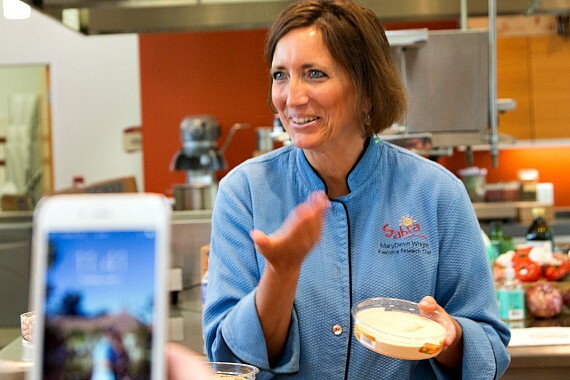 Sabra’s Executive Chef, MaryDawn Wright eats, sleeps and breathes hummus. Her love of and enthusiasm for the product is infectious. 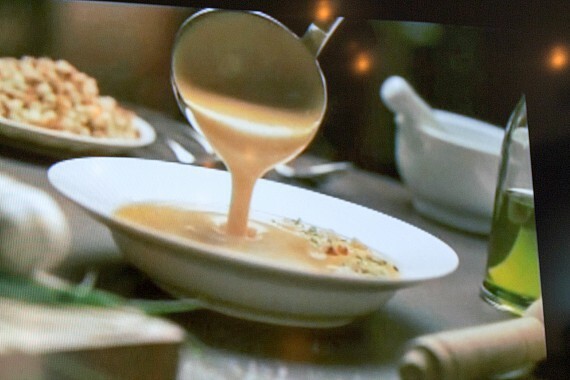 A still from The Martin Agency’s in-house Sabra inspiration video. This short video made us all fall in love with the Sabra message. When I heard I would be a Sabra Tastemaker, I immediately asked my readers if they had any questions, comments or concerns about Sabra Dipping Company and Sabra products. Friends, I have found answers for you. Q1 Would you guys consider making a preservative-free hummus? I know the keeping properties would be greatly reduced, but one of my readers was concerned about the Potatssium sorbate. A1 I asked Sabra’s registered dietitian this question. She said that Sabra used to use three preservatives in their hummus, but once they began working with RDs and ran the ingredient list past them, many had concerns about two of the preservatives (I don’t know which ones), so Sabra stopped using them. The RDs all were comfortable with the use of potassium sorbate, a water-soluble potassium salt of sorbic acid, in the small concentrations used by Sabra. Q2 Is your hummus GMO-free? And if not, would you consider going GMO-free? Q3 Do you still make the lemon hummus and/or will you bring it back? A3 I am happy to report that Sabra has just released their newly reformulated and deliciously lemony Lemon Twist Hummus flavor. Wanna see some highlights from our Sabra Tastemakers’ Richmond Adventure? I tried my hand at making my own inspirational video. I hope it inspires you. Part of my admittedly rough job of being a Tastemaker is coming up with ways of enjoying hummus that my readers may not have thought of before. Today, inspired by a benne (sesame) seed cornbread at Chef and the Farmer last week, I made a wonderful Southern cornbread with hummus and za’atar. 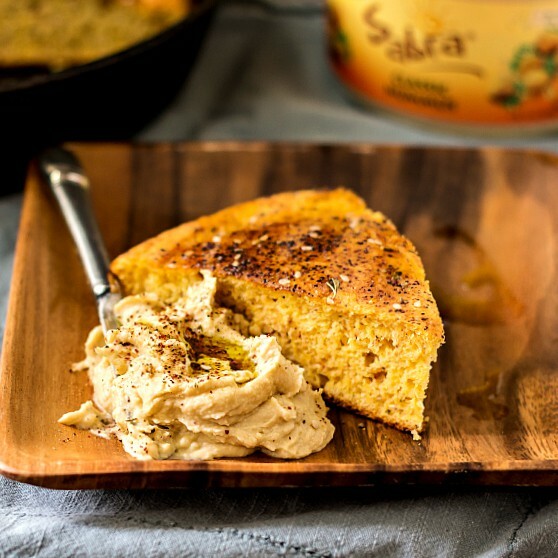 With added layers of flavor from both Sabra Classic Hummus and Spiceologist Hummus House Za’atar Spice Blend, this cornbread is unlike any other cornbread you’ve ever had. The hummus brings a bit more depth of flavor and moistness to what can sometimes be a very crumbly bread while the za’atar brings the warmth of cumin, the lemony punch of sumac, the slightly bitter herbaceousness of oregano and the nuttiness of sesame. It is the perfect vehicle to bring more hummus to your mouth, and I have it on good authority that it is excellent topped with some sausage-rich tomato sauce and a fried egg. 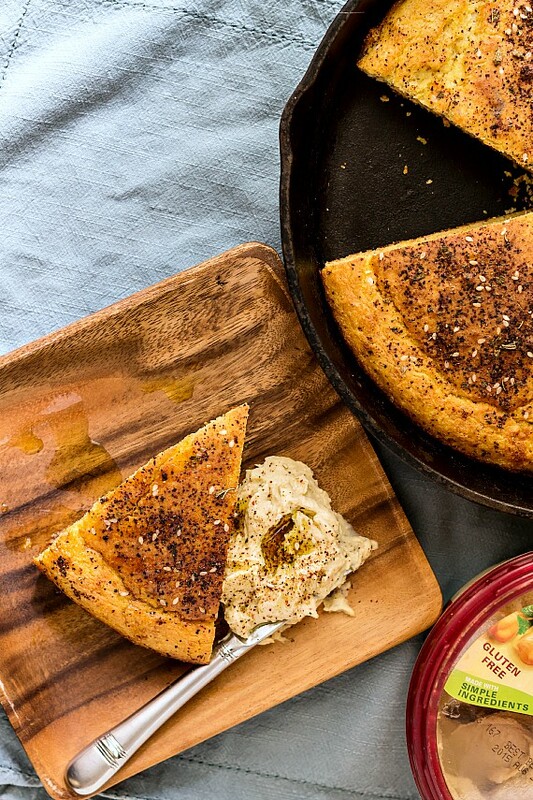 This traditonal Southern cornbread gets a twist with hummus and za'atar. Serve it as the perfect accompaniment to a curry or use it to bring even more hummus to your mouth! Most of you know I normally weigh my ingredients, but many old-fashioned Southern cooks go by feel, so in this case, I just used volume measures, measuring the cornmeal and self-rising flour by the scoop and sweet method. Preheat the oven and a 8" or 9" cast iron skillet to 450F. In a large bowl, whisk together the cornmeal, self-rising flour, baking powder, dark brown sugar, za'atar and salt. Set aside. In another bowl, whisk together the milk, hummus and egg. Set aside. Carefully pull the rack out of your oven and put the 2 tablespoons of lard or butter into the skillet. Close the oven and let the fat melt. Using a heavy pot holder, carefully swirl the pan to distribute the oil over the bottom and halfway up the sides of the pan. Pour the extra fat into the wet ingredients and whisk in. Make a well in the center of the dry ingredients and dump in all the wet ingredients. Fold or gently whisk together until well combined. Don't over-mix, so don't worry if your batter still has a few lumps. It will be fine. Set aside for a moment. Scrape the batter into the skillet, smoothing the top if necessary. Sprinkle 1 1/2 teaspoons za'atar evenly over the batter. Bake for 20-25 minutes or until the cornbread is a deep golden brown and is firm to the touch. The internal temperature should be 200F. Remove from the oven and let sit in the pan for five minutes. Carefully turn the cornbread out onto a rack so the bottom and sides of the cornbread stay nice and crisp. Serve warm. Store at room temperature for up to 3 days. Reheat to serve. Make the cornbread. Eat the hummus. Be creative. Be inspired. Thank you so much for taking the time to read today. Have a lovely day. I don’t have to be sold on the glories of hummus, I love it and will be trying your cornbread — but my Very Important Question is: Why is everyone in the group photo of Tastemakers wearing sweaters in the South in June??? PS: Jenni, I made your Ham-Poppyseed Party Biscuits for a part of 40 youngsters yesterday, and they were a smash hit, even with me and I was prepared to dislike them. I was so glad that I stowed my misgivings and used the yellow American mustard you recommended. It had just the right amount of vinegary sharpness. I bet I ate a dozen of them over the two days I was cooking for the party. Another PCO winner! You’ve become my Go-To Guru for retro foodstuffs. Yeah, you cannot mess with the perfection of those biscuits! lol Glad you went with the “yaller” mustard. It’s the best for the biscuits. And if you only ate 12, you’re doing well. I cannot resist them, and they are gorgeous reheated in the microwave. I know that sounds horrible, but they just get so soft and squishy and irresistable! The sweater thing: I’m not sure I know the answer to that. Except that many of our ensembles required a top layer maybe! lol Folks were there from all over the country, so everyone’s closets look different. It’s always good to have a sweater inside if the AC is freezing too. It was a great trip! Exactly. I probably won’t say anything until after we go back a second time. Although they have to know that more and more folks are driving for hours to go and eat there. They should treat everyone’s meal as if it’s the only one at CatF they will ever have. I will check out the tomato pie–love recipes that take fresh ingredients to glorious heights! And my other important question: You ate at Chef and the Farmer and you didin’t tell us about it??? Sing it, sister! It was a very up and down meal, Maggie. I’m still debating whether I’m going to share the whole experience or not. Some of the food was truly the best of its kind I ever had. Other dishes missed the mark by just a couple of points. My bar was very high, and the overall experience did not meet my expectations, although we will probably go back sometime in a different season to see how the menu shapes up. Oh, I can see how you’d have misgivings about making a big public statement about it. I’ve been dying to go check it out — I’m only a few hours south of Kinston, in South Carolina. Since you’re in the biz, I know you’re probably inclined to give more than one chance, since we all know anyone can have an off day. Just today I made Vivian’s amazing tomato pie, with the first garden tomatoes that have ripened, and it was a Come To Jesus experience. My bosses had company for dinner tonight and I’m so very glad I had picked that dish to make. If you haven’t tried it, it’s on her website. Uses half roasted and half raw tomatoes and it’s simply fantastic.